I am seeing the I have zero days left in my pairing and when I try to download articles I get an "Authentication HTTP Proxy" Error. How can I fix this? then it is very likely that you need to repair your device. 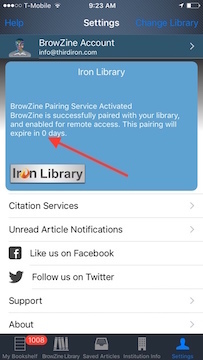 This error message is a temporary bug that will be resolved in a future release of the BrowZine App and we apologize for this confusion! The Pairing Service lasts for 90 days before it needs to be re-paired with your institution. 2) Tap the area next to "BrowZine Account" which has your email listed. 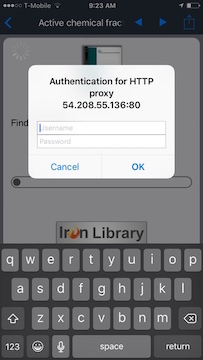 3) BrowZine will confirm that you want to log out of your BrowZine Account. 5) Log back in and you should see the number of days left for pairing increase back to 89 (90 full days which immediately begins ticking down to 89).